Tamarina Golf Course, Mauritius (file photo). Cape Town — Mauritius has been honoured as the ' Golf Destination of the Year for Africa, Indian Ocean and the Gulf States' , at the prestigious IAGTO awards held in Slovenia in October. The winners of the IAGTO excellence awards were announced during the IGTM (International Golf Travel Market) gala dinner. Having received the accolade of 'Golf Destination of the Year' for Africa, the Indian Ocean and the Gulf States previously in 2016, it's clear that the island paradise of Mauritius is fast establishing itself as a remarkable golf destination on the international scene. Having recently received three World Travel Awards - Africa and Indian Ocean region, as the Indian Ocean's Leading Honeymoon Destination, Leading Cruise Destination and Leading Tourism Board for Mauritius Tourism Promotion Authority, it is wonderful that the island's burgeoning golfing offering has also been recognised with an international award. Known for its tropical island allure, with glittering cerulean waters, picture-perfect beaches lined with coconut palms and opulent luxury resorts that unfurl along magnificent stretches of this wonderful holiday destination, its magnificent golf courses are now also taking centre stage in the tourism sector. But over and above being an extraordinary destination for couples looking for a superb escape or families seeking memorable holidays, Mauritius is an outstanding golfing destination for avid fans of the game. In and among the undulating volcanic hills and tropical forests, there is a staggering number of sublime golf courses on the island, from 9-hole courses to world-class 18-hole championship courses designed by such golfing legends as Ernie Els, Peter Matkovich, Bernhard Langer, Rodney Wright, Hugh Biaocchi, Tony Johnstone and, more recently, South Africa's Louis Oosthuizen. 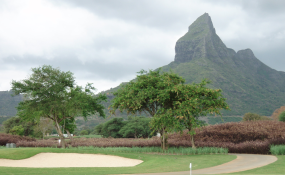 The success and interest in this spectacular golfing island is testament to Mauritius' efforts to boost the golf offering by creating magnificent golf courses and facilities that people are willing (and want) to travel far and wide for. The island is now home to over 12 exceptional courses, many of which boast challenging courses that are designed by legends in the golfing world, set in a paradise location. With Mauritius fast becoming a coveted golfing destination, it's not difficult to understand why the European, Asian, Sunshine and Senior Tours have opted to set base here for some of the most prestigious professional tournaments of the season. It's the perfect destination to host epic golf tournaments that participants aren't likely to forget - just one of the reasons why it's the chosen location for the annual AfrAsia Bank Mauritius Open and the Senior Open. "We are delighted to receive this Award once again, in recognition of the efforts of the private and public sectors working together to deliver the best possible experience to visiting golf travellers. The MTPA is committed to supporting the promotion of golf tourism and the implementation of a golf tourism strategy that will achieve growth and attract more visitors from this affluent niche market," says Amrita Craig, Marketer, Mauritius Tourism Promotion Authority. "We will continue to work with IAGTO and MGTA to position Mauritius as an established, integrated and growing golf destination on the world stage."